The phrase “composite on molar” typically refers to when insurance will not pay for white filling (composite) on molar tooth. Instead, the insurance will only pay the cost of silver filling material. Thus, even when the coverage is set to 100%, in practice, it’s actually 100% of the lower price (silver filling), and the difference will be charged to the patient. Let’s illustrate how it can be setup in ClearDent. 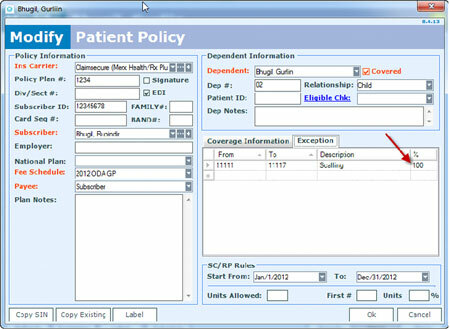 Before we start, one thing to keep in mind is that ClearDent has already preset this rule for major insurance companies such as Pacific Blue Cross, but as this configuration is changeable by the user, if it somehow is not working as you expect, you can follow the example below. 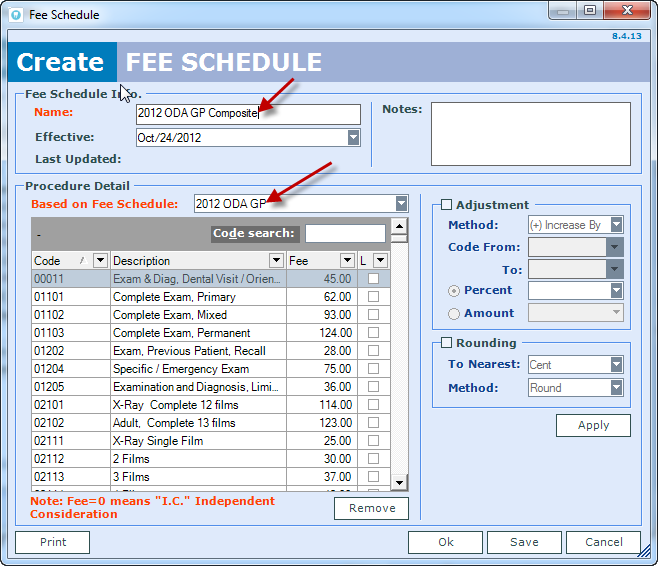 To set it up, you need to create additional customized fee guide, and name it accordingly, such as naming it with the phrase “Composite" at the end of the fee guide name to differentiate it from standard fee guides. Write down prices for 21241-21245 and 21121-21125, and enter those prices into their corresponding codes in the range of 23321-23325 and 23511-23515 (as described above), save it. 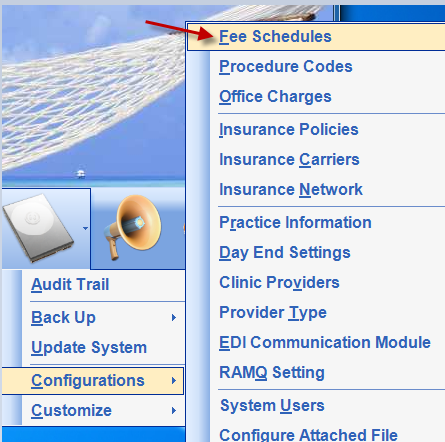 You can close fee guide configuration windows now. Go back to that patient's insurance policy, modify it, on the left hand side, you will see that you can choose that new guide you created as the price guide line this insurance policy follows. Once setup, office will bill 23321($135), but even with 100% coverage, insurance is only responsible for $102 (price of 21241), and patient will be responsible for $33. As you can see, the method above is simple to follow, but it does require going to a couple different windows to do the setup. 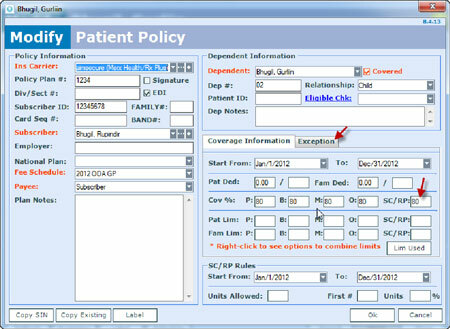 In version 8.4 and later, the process has been vastly simplified and you can enter “composite on molar” or any other types of exceptions right where you setup a patient’s new insurance. To illustrate the flexibility, let’s look at another common insurance rule – coverage for scaling and root planing are different. Example: Root Planing is at 80%, but Scaling is at 100%. You can Enter 80 in SC/RP first. Do you have any suggestions and feature requests? Please visit our Feedback page so you can share your ideas with us! Want to keep up-to-date with what’s new and have tips and tricks delivered to you automatically? Subscribe to our blog or follow us on social media. When I went to an Italian restaurant few months ago, no tables were available and we were told we had to wait for 30 mins. The host asked for a cell phone number to text when our seat was ready. We went for a coffee and enjoyed a good chat. This is what I received from the restaurant. The restaurant was using No Wait. 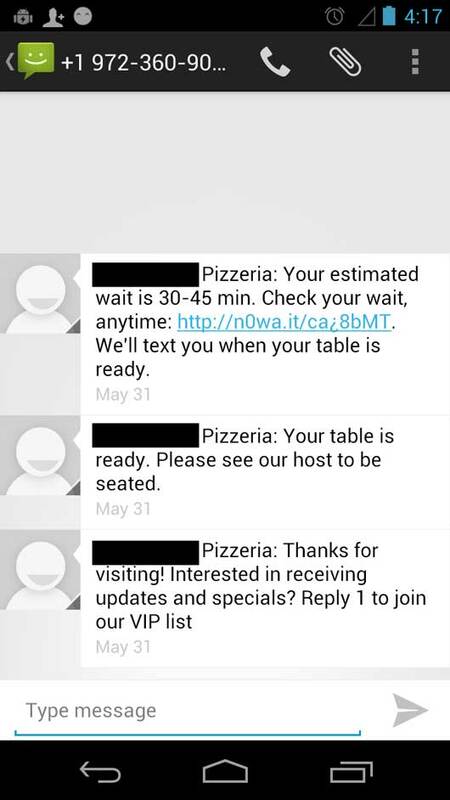 This communication tool saves customers time as well and restaurants organizes their wait list much more effectively. Goodbye paper wait list! I was impressed. Your patients can be impressed, too. Maintaining good relationships with patients is a crucial aspect of a dental practice and many dental offices have started using e-newsletters to promote special offers and encourage referral They are also using it to e-mail/automated calls/SMS to remind next appointments etc. Using these patient communication tools will result in profitable practice as well as better patient care. 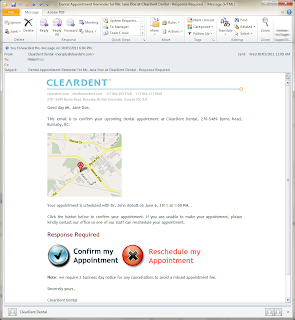 For example, ClearDent offers ClearConnect which is secure, robust patient communication system that is totally integrated within the ClearDent software. 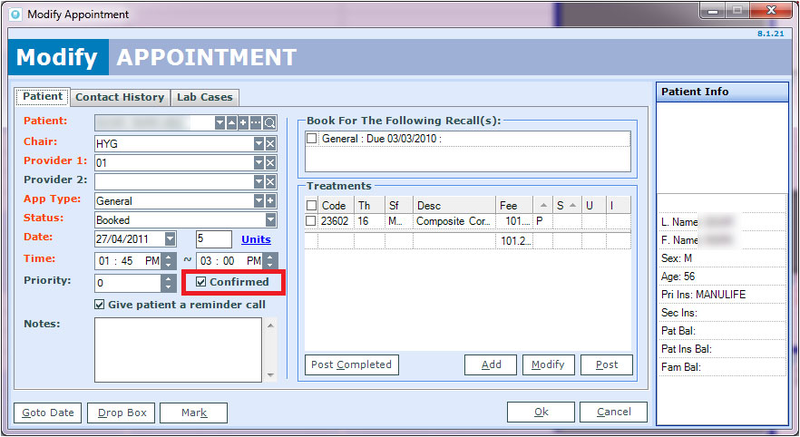 When patient confirms the appointment, confirmation status will be updated automatically in ClearDent. 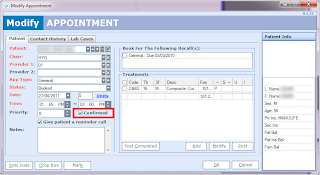 How do you avoid no-shows, late cancellations, losing patients? It’s time to revisit your communication strategy and take advantage of online patient communication system – a new and exciting development in the dental field. Contact ClearDent representative and out how ClearConnect - automated patient communication management tool helps you focus on patient care easily. Until December 31, 2012, you can enjoy special pricing on the ClearConnect setup fee – call your local representative or the general line at 1-866-253-2748 x 1 to get more information today! 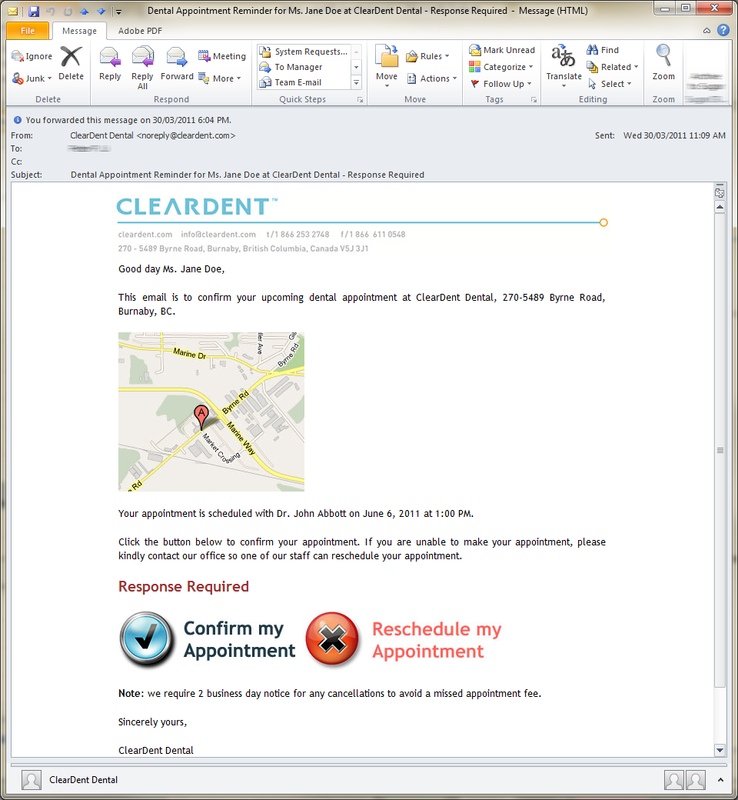 We are excited to announce that ClearDent 8.4 will be available on November 30, 2012. Version upgrades are always FREE and can easily be done by scheduling a time with us so we can connect to your computers and perform the upgrade. Please do note that to upgrade, you need to ensure your computers meet the specifications. If we determine that your computers are not capable enough, we will decline the upgrade in your best interest until you have the opportunity to upgrade them. This upgrade will take time and you will not be able to use your computers during the process. Time required to complete the upgrade will depend on the number of computers you have. Therefore, in order to ensure that the upgrade completes during your planned down time, such as over lunch time or on a day that your office is closed, contact Technical Support at least a week ahead to schedule. The new version includes a lot of new features and enhancements that have been requested by you! We'd like to thank you for your continued support and feedback. You can submit new feature requests on our website. 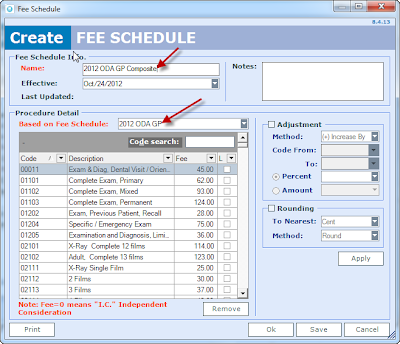 Here's a sneak peek at ClearDent version 8.4. To ensure that you know how to take advantage of the new features, and also to celebrate the inaugural launch of our training webinars, we will offer the following two webinars for FREE when you register by Nov 26th. To maintain compliance, dental offices must encrypt images and documents that are sent electronically for chart transfer or referral to a different dentist. Until now, there haven’t been a lot of options, let alone an easy-to-use option. 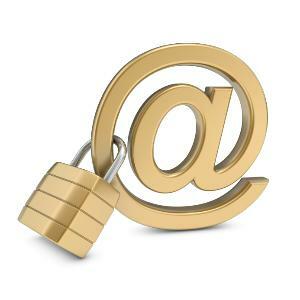 The process of encryption can be challenging. Join us to see ClearDent's solution and how we're able to make it a one click process. See ClearDent's resolution in our Webinar Series this November 20 & 27. Register for free, and learn about all the ClearDent Advantage. Our condolence to people affected by recent earthquake and hurricane Sandy. As a technology solution provider to dental healthcare professionals who rely on our products and services to manage practice data electronically, we would like to use this opportunity to discuss disaster recovery plan to help you better protect your data. The concept presented in this article is applicable not just to the data that ClearDent generates and manages (charts, financials, documents, and digital images), but also to ANY other software that you use at home and at work. 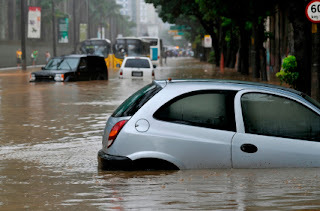 According to a recent study by Symantec, 57% of small businesses do not have adequate or any disaster protections. Therefore, in addition to damages that are potentially caused by natural disasters, even regular wear and tear on computers can create catastrophic consequences, such as irrecoverable data loss. On the other hand, it is very easy to create backup copies with digital dental records, much more so than you can with paper charts. Therefore, we strongly suggest that you take advantage of this and create a proper back plan, which protects your invaluable data from natural disasters and regular wear and tear. In addition to manual, on-site backup to external hard drives or USB keys, having an online back that stores your data offsite and encrypted is crucial. For ClearDent users, we have a simple, easy-to-setup, and cost effective online backup system – ClearVault. Starting at $19.95 for the first GB and $4.95 for each additional GB, you can backup your ClearDent database, digital images and even other 3rd party software data. 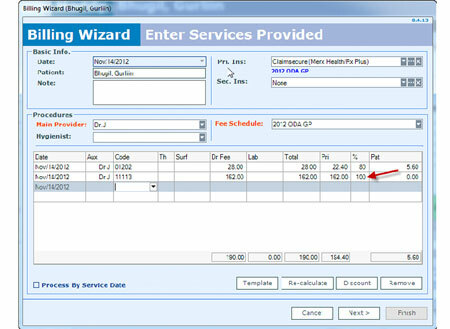 Further, ClearVault stores yearly auditable copies and meets legal healthcare record retention requirement in Canada. There are, of course, other online backup systems. These 3rd party online backup systems can also be used to backup ClearDent, but unlike ClearVault, which automatically knows where to look for all the data that ClearDent generates and manages, you need to be conscious and careful to ensure these 3rd party systems are backing up the “right” data. Otherwise, you are effectively not getting what you paid for. More importantly, you need to ensure these 3rd party systems also have a data retention policy meeting or exceeding your provincial healthcare record retention requirement. Think about possible natural or man-made emergency situation and establish your disaster contingency plan. Discuss or share with your staff so everyone could follow its protocol when something happens. American Dental Association has an informative manual on emergency planning & disaster recovery in the dental office. More and more people look for information online and people would do so more when crisis hits. Social media such as Facebook and Twitter are accessible from a smart phone or a computer, and it is a great tool to let patients know about your situation in addition to regular phone calls. Images above are some of the samples that Facebook and Twitter posts from various New York dental offices posted during hurricane Sandy. So, does your practice have a disaster recovery plan? Please feel free to contact a ClearDent representative by emailing info@cleardent.com or call 1-866-253-2748. We’d be more than happy to give our advice for FREE. Or, if you are an existing ClearDent customer and would like to get more information about ClearVault, your dedicated ClearDent consultant will be more than happy to provide them. 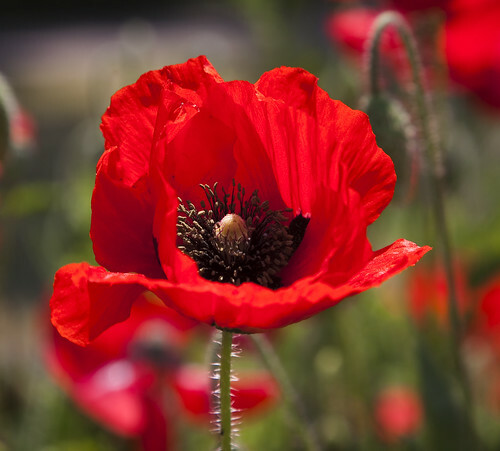 Please note that ClearDent Support will be closed for Remembrance Day. We will, however, have our Emergency Pager number available between 9am – 5pm PST should you need to get in touch with support for any URGENT matters. The Emergency Pager number is 604-292-2268. ClearDent Support will be closed from 12pm to 5pm PST (3pm to 8pm ET). The business hours for this day will be 5:45am to 12pm PST (8:45am to 3pm ET). The ClearDent Support team will be attending an important training session to improve our skills so we can serve you better in the future. We apologize in advance for any inconvenience this may cause. Want to keep up-to-date with what’s happening at ClearDent and technology in dentistry? Are you an existing customer who wants to stay connected with us? Please subscribe to our blog or follow us on Facebook, Twitter, and Google+. Are you reluctant to switch to fully paperless or digital? 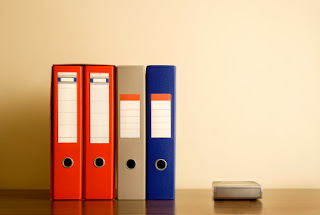 Do you think the traditional way of keeping records is more cost effective? The article on Dental Economics presents a different perspective. There are five major advantages of switching to digital dental records. "Looking at the big picture, it becomes obvious that maintaining the traditional dental chart is not free. In fact, it is very costly. ... looking strictly at the dollars and cents as outlined in the table should give you a new perspective on the long–term investment in your practice. Plug your own numbers into the table and see what you're leaving on the table." To read more about the study, here is the Dental Economics website: www.dentaleconomics.com. To learn about ClearDent and how to be successfully paperless, please feel free to drops us a note at info@cleardent.com or call us at 1-866-253-2748.